and this chalkboard is where the eyes rest. So, it's a great spot for an autumn arrangement! 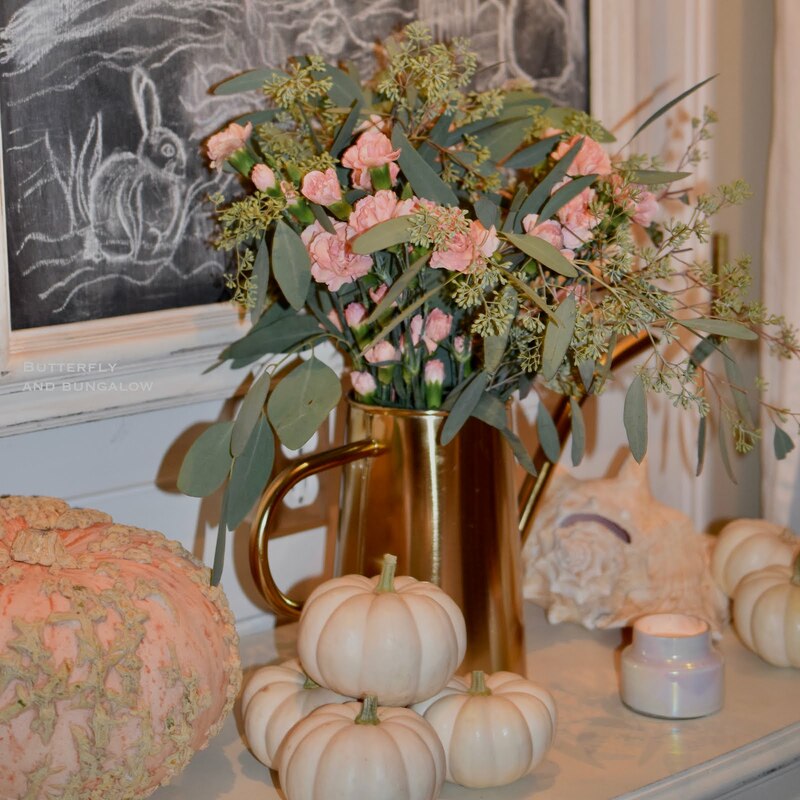 I love coral-pink, warty pumpkins, and this year, I grabbed one while they still had them. I mixed it with the small cream pumpkins and a few things from the sea. 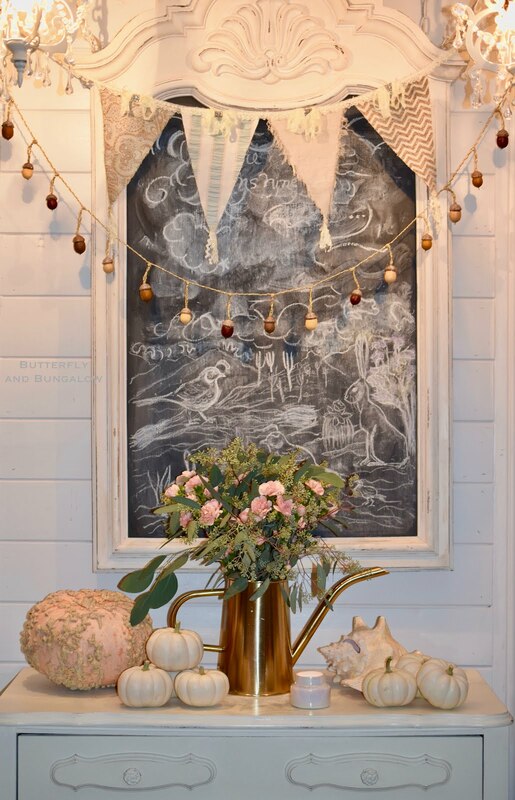 I bought the acorn garland, but painted the orange pumpkins Annie Sloan Arles. 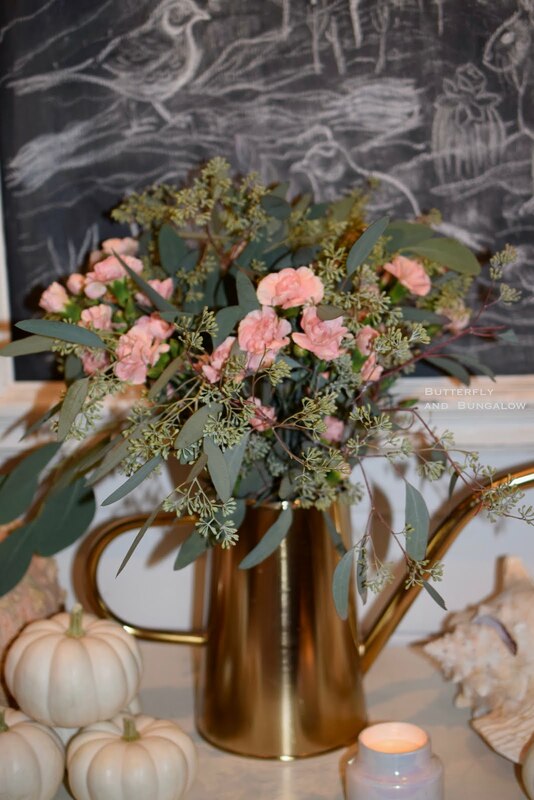 The flowers are a coral shade of mini carnations combined with eucalyptus in a gold metal watering can. Carnations often last a week here, but I think a bunch of baby's breath would be pretty as well. At night, I add a small candle. These colors have such a beautiful pink glow at night. 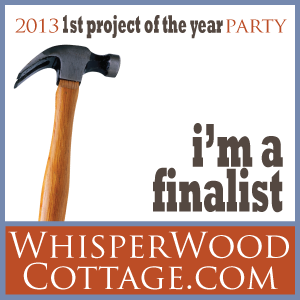 The other spot that is decorated was done by my daughter for her teen shed. Very pretty and soothingly subtle. A lovely spot for the eye to rest... Glad that you snagged the pink, warty pumpkin. I have never seen one in my corner. You have such beautiful style! You always inspire me. I have big seashells on the table in our entry...I need to add some pumpkins! Hugs! Su this is such a pretty arrangement and vignette. I love the copper, pinks, and soft neutrals! How pretty, such a lovely, soft way to say autumn. I picked up two bunches of eucalyptus at Traders Joe's today, it is the first time I have seen it there. Now seeing how you used it has given me inspiration. Thank You! Cute little setting to bless the eyes. Love just love. Sooooo pretty. 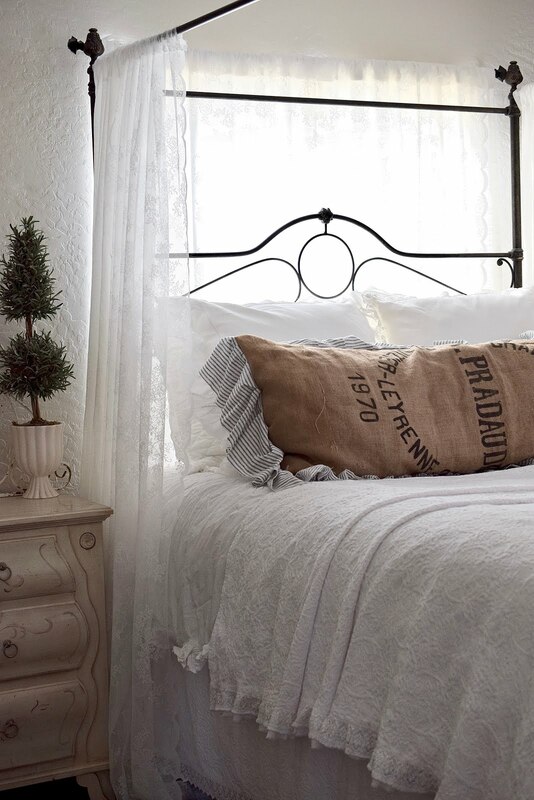 Simplicity is the most elegant way to decorate. Gorgeous! the vignette is so pretty and looks terrific. Love the flowers also. Such a pretty spot! 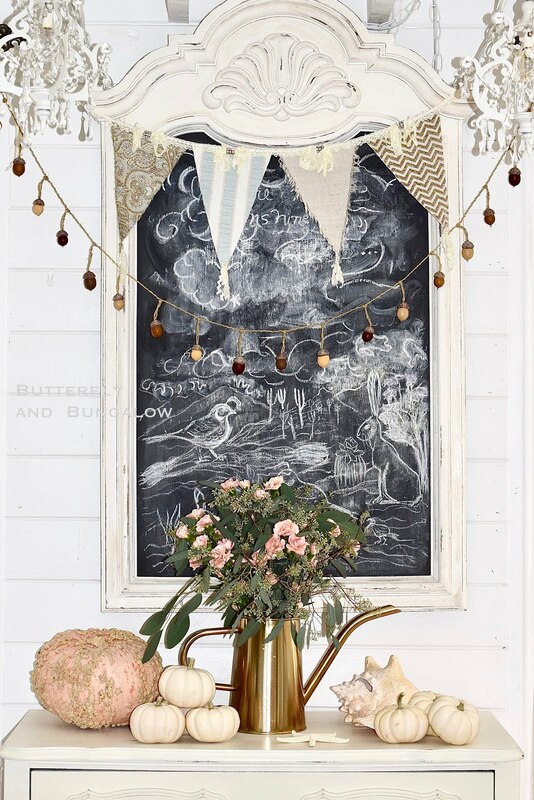 Your chalkboards are always fun and the acorn banner is perfect for fall. These pumpkins are a favorite of mine too. I think they look like they have barnacles...perfect seaside or I like to say seawashed pumpkin. Coral is is lovely palette for Autumn. I hope to visit your blog more as I slowly return to my blog. And I hope you will come by to visit and say hello. Happy Autumn Equinox. We had that flu last week too. It is a strange one because it felt like it would come and go for about 7 days. I had my comments open but already closed them. Not sure if I will ever fully return. My days are currently just so beautiful and peaceful the way they are. I hope you feel better soon. Rest and sunshine helped me recover. It may be the same virus. My spouse brought it back from travel. It has been about six days so far, and it does wax and wane. It is strange. Just when you think you are getting over a symptom, something else arises. My daughter has been sick for over a week now, and my spouse still has a cough after 2 weeks. It's nice to see you posting more again after the summer. I love this arrangement and the one a couple posts back. You have such a beautiful way of arranging things. 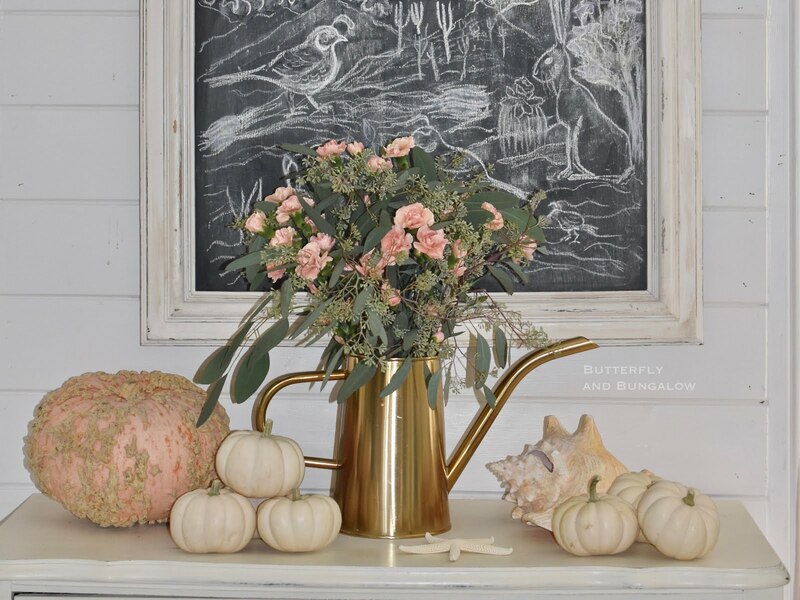 The soft colour of your carnations goes so well with the copper jug. So pretty, Su. I am happy to leave the bright colors of summer behind and enjoy this smokey, delicate palette. You have such a beautiful way of arranging things.